CASSEL "Metalshark BD" DIGITAL stainless steel search head, with 6 inch high by 14 inch wide aperture opening. IP-67 washdown sealed food grade sanitary stainless steel search-head enclosure with microtouch operator control panel. Made in Germany, new 2004, complete with test wands and manuals. As of this writing, the aforementioned Cassel metal detector is in our reconditioning shop being mounted on and integrated with a Goring Kerr all stainless steel CONVEYOR with a 60 inch long by 10" wide food grade rubberized anti-static belt running over a micarta conveyor bed,complete with a belt-stop-alarm reject system, with a washdown drive. When the marriage of the search head and conveyor are complete, USABLE APERTURE height will be 5 inches (the belt and bed will take up about an inch of 6 inch aperture height). 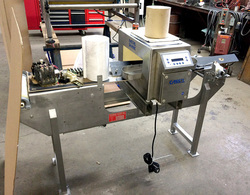 This WASH-DOWN food-process metal detection system is presently being refurbished by our shop, and will be available shortly, in EXCELLENT operational, electrical, and cosmetic condition. NEW "ALARDSIEVE" STAINLESS STEEL WATER RECLAIM SCREEN, 24 inch wide by 36 inch long (top to bottom) wedge wire screen with .040 inch (1mm) sieve openings. 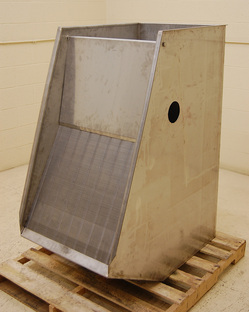 We can also order other screen sieves to YOUR specification in standard sizes ranging from .010 inch to .100 inch, with other sizes available to be priced upon request. 33 inch deep full-width head tank tapering from 20 inches long (front to back) at the top to 15 inches long at the bottom. Complete with a hinged dispersion shield over the weir to help spread the water evenly across the entire screen for optimal laminar flow. 4 inch flanged inlet, 6 inch flanged discharge. Cleanout ports on either side of the cabinet for access behind screen. Head tank and recovery tank both have 1.5 inch female threaded drain ports for cleanout. Rated for approximately 70 gallons per minute per square foot of screen throughput capacity with .040 inch (1mm) sieve openings, running non-greasy solids (actual throughput will depend on solids and flow characteristics). As of this writing, this water treatment hydrosieve type screen is NEW in stock, ready to go and available for immediate shipment. OR find it on our general listings page under "W" for WATER RECOVERY. SIX INCH FOOD PUMP with STAINLESS STEEL FEED TANK and DRIVE. Cornell model 6NHPP-F16K cast iron expanded volute food pump (for gentle handling of delicate food products), with 6 inch diameter inlet/outlet connections, coupled to a stainless steel tapered bottom feed tank 41" long by 33" wide by 19" deep; at a 35" product infeed height, with a 18.5" height to center of return flange. Tank has a 2" inner diameter NPT threaded (female) cleanout drain near the return flange end, at a 14.5" discharge height. 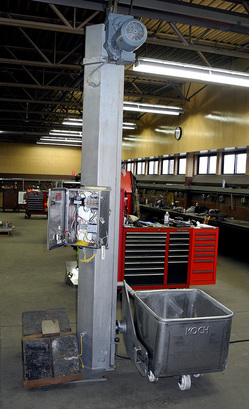 Pump and tank are mounted on a tubular stainless steel frame in common with a 208/230/460 volt 3 phase drive. According to manufacturer literature (pump curve available on request) capable of approximately 500 gallons per minute at 55 foot head with solids handling ability for product up to 4" diameter by 6" length. Cornell's patented expanded offset volute design feature makes for much gentler product handling. NEW, with two-year manufacturer warranty. As of this writing, this food pump flume kit is in stock NEW at Alard, available for immediate shipment (lead time required to obtain / install custom motor drive HP). on our general listings page under "P" for PUMP. NEW ALARD-SMITH 4 HEAD ROTARY CABBAGE CORER, all stainless steel, for cole slaw, sauerkraut, and freshcut processing applications. Automatic operation, with manual placement of the heads on a revolving table. NEW Alard- Smith 4 Head Continuous Rotary Cabbage Coring Machine, Alard item Y0261 from Alard Equipment Corporation on Vimeo. Manufactuer rated for up to 28 heads per minute. All stainless steel product contacts, frame and screen shrouding. 110 volt single phase (standard household current) motor standard, 220 volt and 3 phase options available. As of this writing, we have both refubished (steel frame) and NEW (stainless frame) cabbage coring machines available in stock, ready for immediate shipment! Complete with (2) 350 gallon pressure tanks manufacturer tagged, National Board and CRN coded for 200psi, and a ZEKS HeatSink true-cycling AIR DRYER. 460 volt 3 phase main electrical input. 2HP 230 volt 3 phase air dryer electrical input. 29,000 running hours. We removed from closed facility in VERY good operational condition (see video). As of this writing, this 60HP screw compressor is in stock at Alard in very good condition. all stainless steel with slide gate discharge. 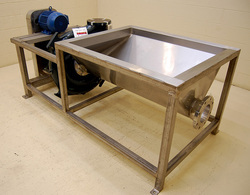 An all stainless steel food grade USDA sanitary 12 cubic foot paddle mixer, manufacturer rated for 400 pounds capacity, with a 21.75 inch long by 39 inch wide by 25 inch deep mixing vessel, with pneumatic slide-gate discharge; --discharge opening 9 inches long by 8 inches wide. Hinged top lid. The paddle agitator has a quick release for cleaning, with quarter-inch thick paddles on a 2.75 inch center shaft. 62 inch infeed height, 21.25 inch discharge height on tubular stainless steel legs on casters, which are configured wtih UHMW plastic covered stainless steel rails with height clearance to position Koch 400 pound totes/carts (not included) beneath the discharge. Complete with operator control panel with safety interlock for the lid. 208/230 volt 3 phase electrical input. the "twin" machine to this one. 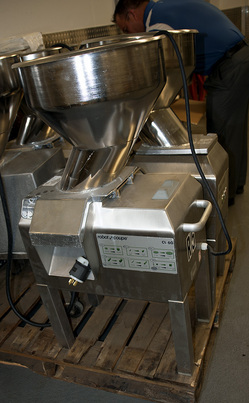 As of this writing, this late model (new in 2005) paddle mixer is in stock in excellent operational, mechanical, and cosmetic condition, available for immediate shipment. KOCH COLUMN LIFT / CART DUMPER / BUGGY DUMPER, all stainless steel. Configured/sized for dumping 400 lb V-Edge buggies with an adjustable dump height (bolt on dump head) adjustable in 2 inch increments from 76 inch dump height to 84" dump height. USDA sanitary food grade stainless steel construction, including stainless steel lift chain, and stainless steel control box. 203/230 volt 3 phase electrical input. As of this writing, we have AVAILABLE SEPARATELY, a quantity of 400 pound capacity Koch V-Edge buggies (Y2059); --if you need carts to go with the dumper, CALL to ask your Alard sales representative for current availability. As of this writing, this stationary tote dumper is in stock in excellent operational, electrcial, mechanical and cosmetic condition, available for timely shipment. 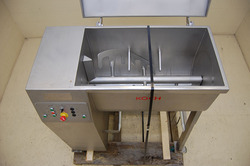 Koch 400 pound cart(s)* with a slight pour spout shape on one edge; 25.5 inches long on the pour edge, 24 inches wide on the lift edge, 19 inches deep, with 1 inch rolled and welded rims at a 39"infeed height on (4) white hard plastic wheels. 14 gauge sides, 10 gauge bottoms, with 12 gauge stainless steel quick drain wheel supports. 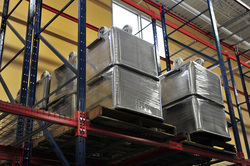 All food grade stainless steel USDA sanitary construction. Complete with heavy duty plastic lid. As of this writing we have AVAILABLE SEPARATELY a Koch column lift / buggy dumper (Y2062) in stock; --CALL to ask your Alard Sales Representative for current availability. *As of this writing, we have QUANTITY (50) of these 400# V-Edge dump buggy totes in stock in excellent condition; --CALL to ask your Alard Sales Representative for current availability. GENERAL PURPOSE CUTTER - SLICER / DICER / SHREDDER / GRINDER; ROBOT COUPE MODEL CL-60 Series D.
A vegetable preparation machine for which the manufacturer offers a complete selection of 46 interchangable cutting disks for slicing, grating, julienne cuts, dices, and french fries. Four interchangeable feed head configurations are available for coin cuts, angled transverse cuts, and push feed. Manufacturer rated for throughput capacity of up to one ton (900 kg) per hour (depending on product, cut type and cut size). Conical feed hopper 16 inch diameter at infeed, with 4" diameter opening to cutting chamber. 41 inch infeed height, 16 inch discharge height. Food grade sanitary stainless steel product contacts, aluminum base; --all contact parts can be quickly and easily dismantled for cleaning. Portable, with handle on one end, and wheels built into the legs on the other. 208/230 volt 3 phase drive, with operator controls, and magnetic safety interlock. As of this writing, we have quantity (3) (2) left, of these Robot Coupe cutters in stock at Alard in very good operational condition, available for timely shipment.